I have been admiring Cecelia Louie‘s modern approach to quilling for a long time and I was always impressed by her simple, yet effective and expressive designs. Her one of a kind, unique, out of the ordinary projects make her style immediately recognizable. Needless to say, I was so happy when I found out that she wrote and published a book with paper quilling tutorials, Pretty Quilled Cards, to share with us some of her secrets and techniques! They say “never judge a book by its covers”, but this time I can assure you that the beautiful picture with quilled cherry blossoms is a great indication for the other wonderful projects inside it. I find that the title is a little bit misleading, as there are some layouts who fall outside the card category, like the cupcake toppers, wine glass charms, gift tags and a framed name plaque. Over 25 creative designs for all occasions await paper enthusiasts to try their hand on them and learn new things in the process. I absolutely love the fact that even the border for the contents page is quilled! The book opens with a generous introduction, providing detailed information on the quilling supplies needed and various quilling techniques. Cecelia’s instructions are clear and followed by illustrated pictures, making everything look very easy. I am sure beginners will greatly appreciate this part and will give them the confidence they need to give the projects a try. Even an experienced quiller can pick up a few new tricks, I know I did! I learned how to create precise open shapes by gently softening, scraping, rubbing or crimping the paper strips with the needle tool (a method which I am planning to use in my next paper graphic projects), as well as a new way to apply the glue to the quilled pieces. … followed by the instruction section where you will be guided how to make each piece in the right order, all accompanied by detailed illustrations. It really can’t get much simpler and clearer than that! I have never seen such elaborate explanations and so many step-by-step pictures in any other quilling book. I really must congratulate the author for her amazing attention to detail and hard work! Each project is assigned a skill level. Newcomers can choose to start with the easy ones and work their way up, as for the seasoned quillers, they can dive right into the more difficult projects. In Cecelia’s own words: “as when you’re working with a recipe, nothing here is set in stone”. This book is merely a tool to guide you on your first steps, providing the basis needed and plenty of inspiration for one to start creating new, original designs. 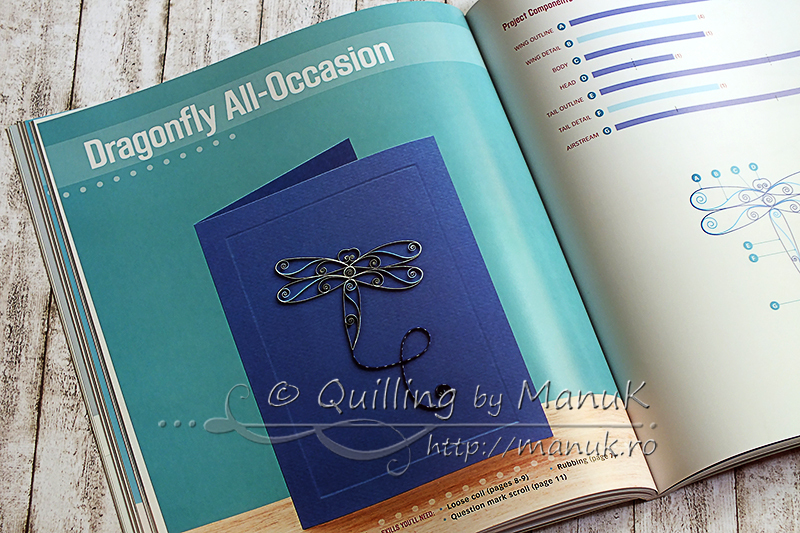 Pretty Quilled Cards is a must-have for both beginners and experienced quillers. Even though I’ve been quilling for more than 3 years now, in which I have acquired a fair amount of experience, I gladly confess that I have learned some new tips and tricks. Cecelia, thank you so much for the book and for giving me the opportunity to review it! I will treasure it forever! N.B. This is my first ever book review. I was highly flattered when I was asked to write it and a little bit anxious in the same time. Don’t forget to visit Cecelia Louie’s blog – Paper Zen – to see more project excerpts along with other great designs and tutorials. You can also read about her experience as an author and find out how to purchase the book! Awesome Review Manu…Great book for beginners indeed!!! Thank you for your feedback, Sathya! I really wish I had this book back when I was a beginner myself! Manu, this is the best book review I have seen for this book. Have been following Cecelia and Paper zen for so long, love her minimal designs 🙂 Love the new look of your blog too. Thank you very much, Suman! It was a pleasure and an honor for me to write the review for such a detailed quilling book. Cecelia really did a wonderful job!